Technology is fundamentally altering the way we live. Know as the fourth industrial revolution, it is blurring the lines between physical and digital activities. The quaternary sector is emerging and disturbing most of major the industries in every country. What is the quaternary industry or sector? The quaternary sector or quaternary industry is the economic activity based on the intellectual or knowledge-based economy. This involves work that conceives, creates, interprets, organizes, directs and transmits with the help and support of scientific and technical knowledge. The foundation of this type of activity is the creation. It is the sector of mind, knowledge, and skill. It creates value for the society from technology applications or human ingenuity. From an economic point of view, the quaternary sector is an additional delineation of the tertiary sector, that is, the economic activities that make up the quaternary sector also belong to the tertiary activities. Some industries in the quaternary sector are consultancy, financial planning, designing, information technologies, research and development (R&D) and generation of information. Also according to some interpretations, other activities that belong to this sector are the entertainment industry, media, culture, and government. Some examples of products and services are artificial intelligence, big data, robotics, internet of things, autonomous vehicles, 3D printing, nanotechnology and quantum computing. The main difference between the tertiary sector and the quaternary sector is that, although both provide services, the services of quaternary activities are intellectual rather than repetitive activities. This difference is difficult to establish in the real world but gives a notion of what the sector is about. In this way, jobs such as cashier, hairdresser, taxi driver or sweeper are easy to classify as labors from the tertiary sector due to their repetitive actions. While activities such as academic researcher, financial analyst, web developer, movie director, writer or painter are classified easily as jobs from the quaternary sector. However, works like doctors or teachers are difficult to categorize in one or another because it is debatable how focused they are on intellectual research and development. With the automation of jobs, the activities of the quaternary sector are becoming more prominent. Thanks to the technological advances, many tasks from the primary activities (agriculture), secondary activities (industry) and even from the services sector (restaurants) have been mechanized. For example, in agriculture, the use of machinery, fertilizers and modern techniques of cultivation have produced an increase of the total agricultural output while demanding less human work. This idea is reflected in the theory of the three sectors developed by Colin Clark and Jean Fourastié. The theory explains the existence of the three sectors hypothesis of the economy and the emergence of a fourth, the quaternary sector, once the country achieves some degree of development. 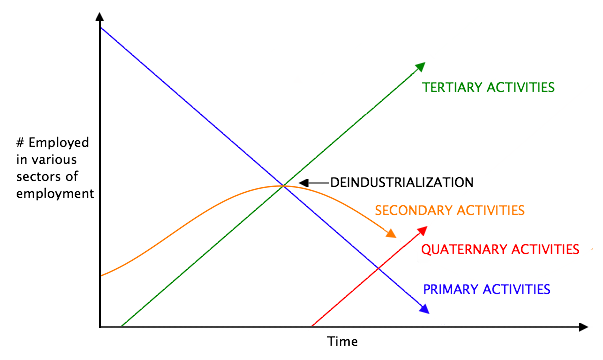 As seen in the graph, sometime after the country manages to develop through industrialization, a process of deindustrialization begins causing the intellectual services start to grow, thus emerging the quaternary sector. However, this doesn't mean that the quaternary sector is only found in developed countries. While it is true that this sector is more prevalent in countries where this type of activity is promoted and people do not live in a state of subsistence and can engage in intellectual activities, several developing countries also have important quaternary activities.